imddg69 1 year, 7 months ago. Here is the much awaited Nougat 7.0 ROM for Moto G 2014 LTE CyanogenMod 14 (CM14). For latest updates, stay tuned to the Lineage OS device list page. This Nougat 7.0 has come for Moto G 2014 LTE via CyanogenMod 14 ROM. Since Google released Android Nougat Source code, we have update many Android NOUGAT AOSP ROMs and also many CyanogenMod 14 ROMs updated and many are yet to come. This Moto G 2014 LTE for CyanogenMod 14 is brought to you by developer LuK1337. Earlier he had ported CM14 for Moto G 2014 (thea). If you want to help LuK1337 for his awesome work then you can Donate to LuK1337 to keep up his good work. Installing a custom ROM on a the 2nd Gen Moto G 2014 LTE may require the bootloader to be unlocked on Moto G 2014 LTE and a Custom Recovery on Moto G 2014 LTE, which may VOID your warranty and may delete all your data. Before proceeding further you may consider backup all data on the phone. You are the only person doing changes to your phone and I cannot be held responsible for the mistakes done by you. ALSO KNOW THAT THIS IS A DEVELOPMENT BUILD AND CONTAINS MORE BUGS THAN YOU CAN THINK. Unlocked bootlaoder on 2nd Gen Moto G 2014 LTE and TWRP on Moto G 2014 LTE. Download and Copy the Nougat GApps and CyanogenMod 14 Nougat ROM ZIP to Moto G 2014 LTE. First flash the Moto G 2014 LTE CM14 ROM ZIP from device. Reboot and Enjoy the CyanogenMod 14 Nougat ROM on Moto G 2014 LTE. Copy the 2nd Gen Moto G 2014 LTE CM14 ROM ZIP file to your phone. Stay tuned or Subscribe to the Moto G 2014 LTE (thea) forum For other Android Nougat ROMs, CyanogenMod 14 ROMs, other ROMs and all other device specific topics. 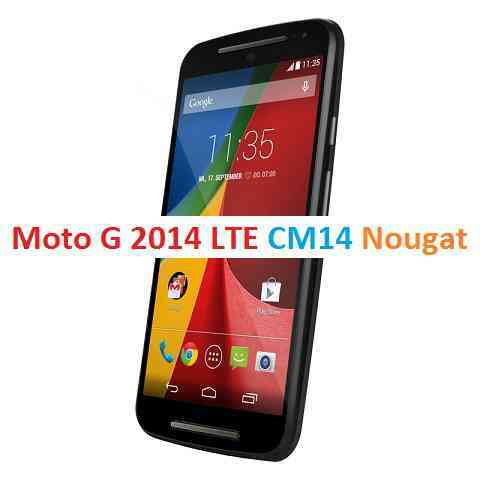 The development thread for Moto G 2014 LTE CM14 ROM is here. No sim card found after flashing cm14 in moto g 2014. Wifi is working fine though. I wiped my LG G2 (vs980…unfortunately) on Monday from an old custom CM ROM and installed a new CM mod (13). Since then, the phone won’t recognize any SIM inserted. I wiped all again, and installed CM 12.1. Same deal. Went back to CM 13 and nothing. Now upgraded to RR 5.8.2 (latest they have for the vs980 model) and still nothing. Everything else works great (apps, wifi, bluetooth, etc), but it still does not see any SIM. I also noticed that when I go into settings and select Cellular Networks, I get a “com.android.phone” error (Not that annoying “Unfortunately…” mess people used to get and it asks if I want to close the app. I have tried clearing all the caches and app data, going into test mode and turning off the radio (several times) for up to an hour, powering fully off, removing the SIM, leaving out for an hour before reinserting and powering back up, and even changing the IMEI number and nothing has worked. By the way, using TWRP 2.8.6.0 to flash my drive. Oh, and I used 3 different SIM chips and they all work fine in a PUK. Someone please help. I can’t afford a new phone right now.